I recently traveled to Washington, D.C., with Special Olympics Illinois for Capitol Hill Day, the annual event when Special Olympics athletes, volunteers, and executives from across America travel to Washington to meet with their respective state Representatives and lobby for, as was the case this year, continued federal funding. In our coalition was my father Jim Corrigan, SOILL’s past board chair, and me; Special Olympics Illinois Regional Director Linda Wunder; Kankakee School District special education teacher and coach Penny Sylvester; Unified Partner Kacie Lalumendier of Kankakee and Special Olympics athlete Courtney Illum of Kankakee. We met with nine Illinois legislators and discussed the continuation of the government’s funding toward education and the immersion of those with intellectual disabilities into the school system, as well as grants for medical services such as health screenings for individuals with intellectual disabilities. People with intellectual disabilities are an often inadequately resourced demographic, contrary to common belief. Many athletes don’t receive proper healthcare due to a lack of physicians who can cope with the demands that an individual with disabilities requires. Individuals with intellectual disabilities are also nearly three times more likely to be bullied at school, and federal funding helps integrate students into schools at a young age, hopefully fostering a more inclusive environment that will reduce the amount of ostracized students. The meetings with the staffers tended to last 15 minutes. The six of us would sit down and one of us, usually Jim or Linda, would give a little background about Special Olympics, the success we have enjoyed, and emphasize the number of Illinois athletes – which exceeds 42,000 between traditional and Young Athletes and grows annually. Then we’d discuss our funding request and explain our reliance on federal money – due to the fact that Special Olympics is a not-for-profit organization. The Congressman or staffer would then generally ask a few question. My role in the group was that of a volunteer and I often fielded questions such as “Why did you join Special Olympics?” or “What is the role of a volunteer on a daily basis?” After our short talk, it was time for pictures outside with the Representatives’ name plaque, followed by a brisk walk through the annals of the Capitol in an attempt to reach the next meeting. 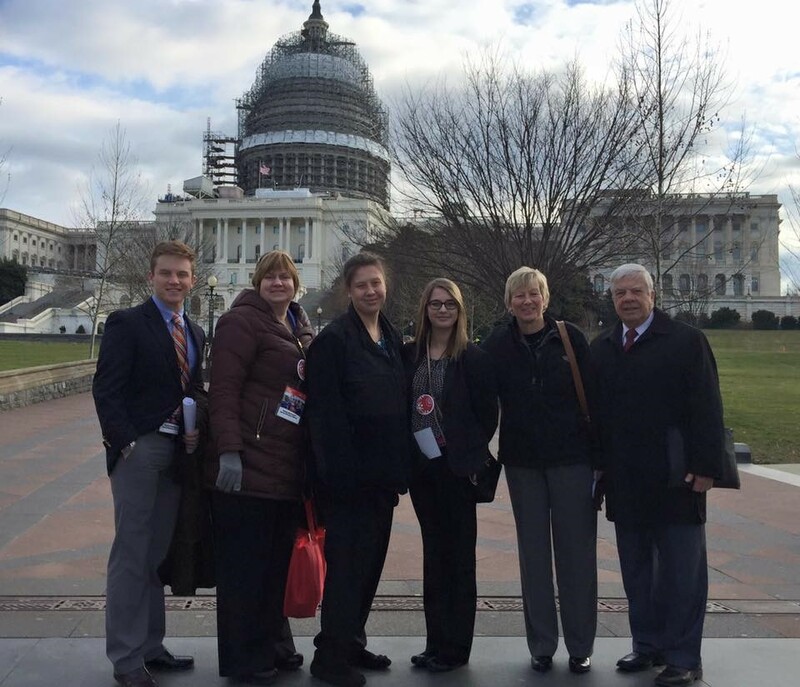 Our trip to D.C. was a major success, with Representatives and Senators from both parties and every state pledging their support, both personally and monetarily, for Special Olympics. Who knew bipartisanship was so easy?